i played through just dance 2 a couple of years ago to see what the hype was all about, and had been somewhat surprised at how enjoyable it was overall. there have been a plethora of sequels and spin-offs since then, and rather than move on to the numbered sequel, instead i tried out michael jackson: the experience on wii next. on wii the game came in two editions, the difference being that the limited edition included an extra track and apparently a replica of jacko’s famous sequined glove, and i believe was only originally available at walmart (walmart = boo! hiss!). anyway, although i’m far from a huge MJ fan, i definitely respect his multiple talents (i hadn’t realized that he’d written most of his own songs) and his long career. the game does a pretty decent job of paying tribute via a range of tracks that include some of his earliest and latest work, although it immediately becomes clear that the game is really just an artist-specific just dance game (apparently the first of its kind, and the game was followed up by black eyed peas and ABBA releases). 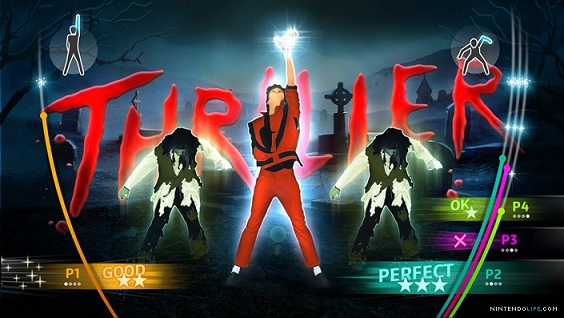 the visuals do a pretty good job of recalling the original music videos via MJ’s avatar and the backgrounds, although i have to say one of the things that really disturbed me was seeing MJ on screen performing choreography that he wouldn’t have been caught dead doing: i don’t think MJ would ever have had to resort to doing the running man or jazzy broadway moves. as would be expected, the choreography is most successful for the songs where MJ danced a lot in the accompanying music video. in those cases the choreography in the game is generally simplified, “inspired by”, and more repetitive versions of the barrage of complicated movements in MJ’s actual video, and works reasonably well in terms of the game experience. the songs that have completely made up choreography are much less believable, esp. since the movements often don’t shy away from rehashing choreography from just dance 2. i’m guessing the average player prob. won’t mind it as much as i did, and in any case the dancing fulfilled my main goal, which was to spend part of my video game time off of the couch and moving around. as with just dance 2 the game provides a surprisingly decent amount of movement, although i’m not sure i would call it a “workout”. also as with just dance 2, since the motion detection is via the wii remote there’s an emphasis on arm movements in the choreography, although, again, there are plenty of foot movements that are essentially optional that help keep you interested on repeated plays. as with just dance 2 the movement recognition can be a little capricious, but oftentimes it’s not too hard to figure out how the game wants you to be doing a particular dance move. and also like just dance 2 you can have friends join in (some of the songs include different choreography with duet or back-up dancer roles) and scoring is fairly incidental to the gameplay, although this game does include unlockable extras in the form of clips from MJ’s music videos and video clips where dance instructors walk you through choreography that’s actually from the music videos. all in all no huge surprises in this game, but i found it to be enjoyable overall and won’t mind dipping into the just dance series again in the future. – i’m surprised that the game has a low score on metacritic since at its core the game is pretty much the same as the just dance games. maybe MJ fans are more demanding than the average video game reviewer? – entry on wikipedia. apparently the xbox 360 version (which used kinect) has completely dwifferent choreography. i checked out a couple of videos of that version on youtube and it looks even more simplified than the wii choreography which to me seems like it would be fairly boring, although that version got better reviews.